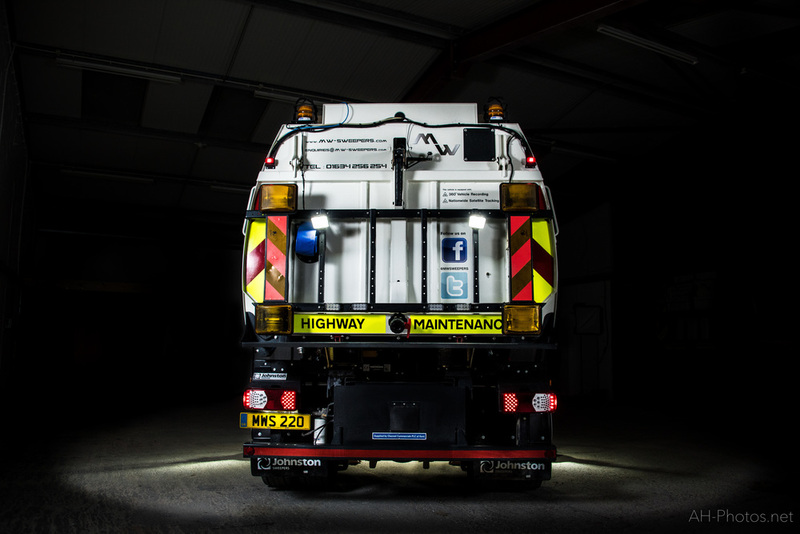 From Road Sweeping to Deep Cleaning... we've got you covered. Being based just outside Rochester, in the heart of Kent, we can travel anywhere in the South-East of England in great time. We regularly run clients across the whole south-east. We supply a reliable and professional service to all our customers. We have worked hard to build up a large customer base with some big name companies but we also pride ourselves on still being welcoming to new customers, big or small. ... and many other types of client. We offer a Deep Cleaning Service. We bring all our specialised pressure washer equipment to you and transform the surroundings back to what they once were. Equipment consists of high pressure rotary hand lances for graffiti removal and the hand held spinning machine which brings everything back to black. We use citrus based environmentally friendly cleaning agents in conjunction with the Deep Clean Machine. We will regularly service the sweepers, either at your premises or our yard. Depending on where the sweeper is normally kept, we will also be available to carry out maintenance and repair work. We are now able to offer Long Term Self-Drive Hires of Johnston VT650s and VT651s. If you are interested in hiring a road sweeper so that you can use your own driver, get in touch! Call (01634 256 254) to find out more about the services we provide. Top of the line, High-End Machines custom fitted with a suite of advanced technology systems to ensure the most efficient and safe service. Our ever expanding fleet is quality not just quantity. All our Sweepers are fitted with a wide range of safety equipment and we have achieved SafeContractor accreditation. We are also registered with PICs Auditing which allows us to work for major Companies such as Tarmac Trading and Brett Aggregates. Our operators are trained to the highest standards and hold all appropriate occupational cards, e.g., CSCS, CPC, Motorway Passes and Area 4 cards. Area 4 cards enable us to carry out Emergency Call Outs and Scheduled Maintenance Work for the Highways Authorities (Balfour Beatty Mott McDonald JV). Our fleet of Johnston VT651s is top of the range. They are fitted with high pressure jet wash spray bars; hand lances and gully sucking equipment as well as normal day-to-day sweeping brushes. Our ever expanding fleet is about quality not just quantity. With specialist equipment proven to save lives and ensure safety we are able to operate in restricted zones, city centres and places with high footfall or congestion. 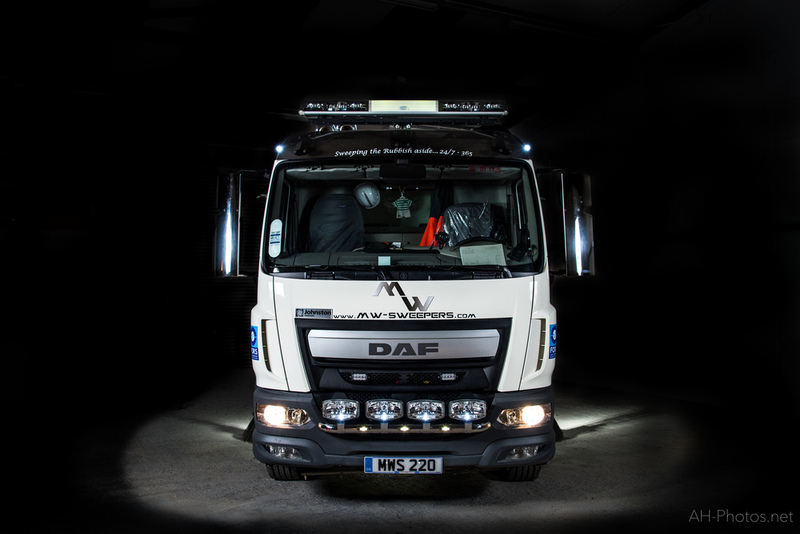 We are continually updating our fleet so that we can offer new vehicles to our customers. Properly maintained we can expect optimum use from them. We've got some serious kit! This isn't your run-of-the-mill 20% off B&Q deal pressure washer. 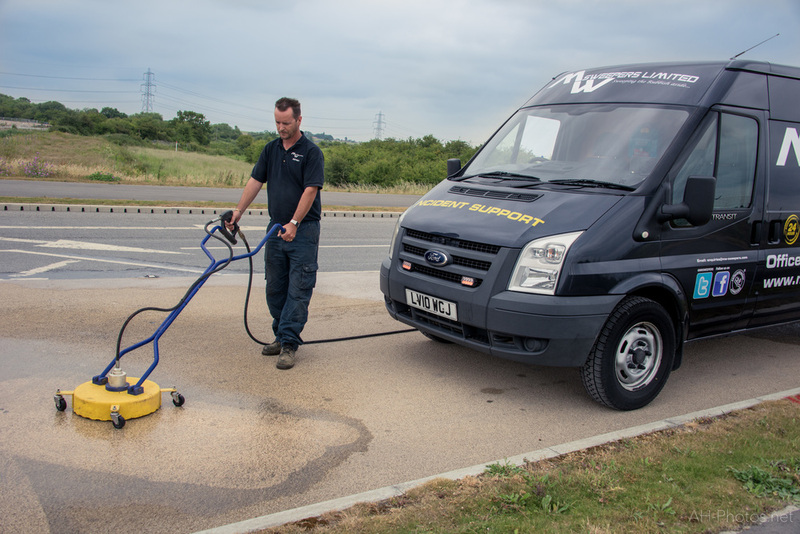 Our specialised, high-pressure washer system is purpose built for professional service. It's interchangeable, adaptive heads allow it to work on a variety of surfaces while it's cleaning solutions are second to none at removing the toughest of stains. We could teach BP a thing or two about cleaning up oil spills. With decades of experience in the industry you can trust us, we're the professionals. 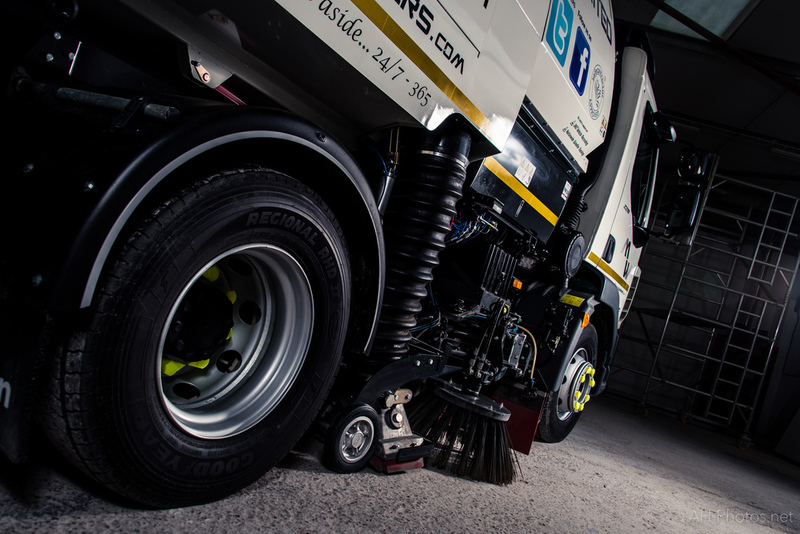 Our operators are experienced in tackling any applications for which the road sweepers are designed. 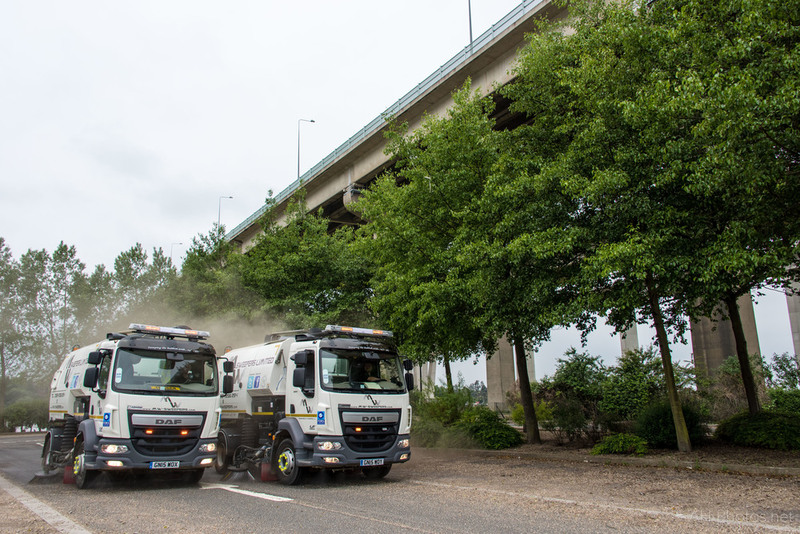 We have successfully completed motorway contracts, including sweeping after the installation of new retroreflective safety devices; planing and resurfacing. We have recently carried out a Deep Cleaning Contract on a large estate in East London (with more work ordered) when we used our Power Washer to enhance the work of the road sweeper. The photographs in the 'Our Services' shows the “before and after” views. All have CPC & CSCS cards, as well as Motorway & 'Area 4' passes allowing them to work on emergency callouts & scheduled Motorway Maintenance. We have, for many years, worked on house building sites; aggregate yards and sand quarries; container ports and dockyards; shopping centers and industrial estates. We have also carried out gully sucking and hand lancing work on many of these sites too. We are employed to keep roads clean during and after fairs, markets and horse races. In spring and autumn we clear large areas of blossom and leaves. We clean the streets after the annual London Marathon and 10k Run; and the annual Prudential Bike Race staged in London and the Home Counties. We also work in various parks in and around London after Festivals and Motor Events.